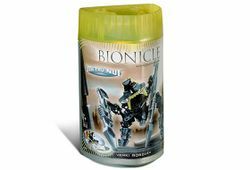 8618 Rorzakh is a BIONICLE set released in 2004. It was one of the six types of Vahki. It comes with the Rorzakh itself, two Staffs of Presence, and a Kanoka disk. In the BIONICLE Universe, they were assigned to Onu-Metru and their Staffs of Presence allow the Vahki to see and hear through their targets. If the set was bought at Wal-Mart in the US during a limited time offer, it would come with the Vahi, which is the Mask of Time, and the Disk of Time. This is a description taken from LEGO.com. Please do not modify it. (see an archive of the product's page) Nowhere to hide! Rorzakh of Onu-Metru are not the strongest or fastest Vahki, but they never give up on the chase. Run anywhere, they will follow, no matter what the risk. Rorzakh Staffs of Presence make it possible for the Vahki to see and hear whatever the affected Matoran does, without the Matoran being aware. Includes Kanoka disk launcher and glow-in-the-dark disk. Nowhere to hide! Rorzakh of Onu-Metru are not the strongest or fastest Vahki, but they never give up on the chase. Run anywhere, they will follow, no matter what the risk. Rorzakh Staffs of Presence make it possible for the Vahki to see and hear whatever the affected Matoran does, without the Matoran being aware. Includes Kanoka disk launcher and glow-in-the-dark disk.